March has been a month of further bearish correction for cryptos. Some alts like EOS or TRX fared slightly better than Bitcoin but others like ETH (Ethereum) fell even harder. Even earlier in the month, price action for looking shaky for Ethereum and we anticipated its decline versus the USD as well as BTC. As we can see on the daily chart, price has retraced below its December low, which was around $420. December was a big month for ETH and cryptos in general, so falling below these lows suggests the market has killed a lot of the hype that went into the crypto space towards the end of the year. Now as price slides under $400, ETH/USD is also entering a consolidation range between roughly 132.30 and 419.50 This is a wide range, but I suspect price will be able to find support if it dips towards $300. At this point, we should limit any bullish outlook to $500. 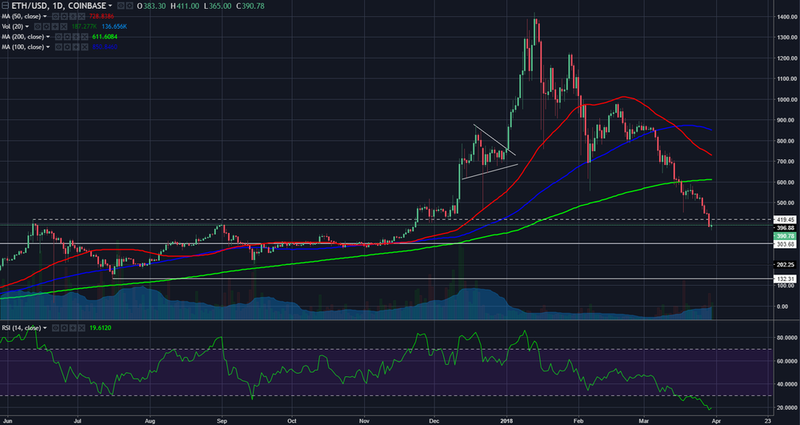 A break above $500 will be needed to bring ETH/USD out of its bearish to neutral outlook.